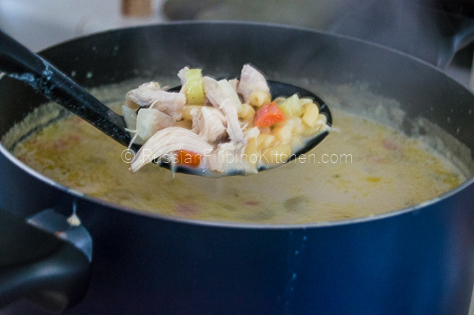 I have a weakness for good chicken soup especially on cold rainy days or when I’m not particularly feeling well. A hot bowl of soup soothes, heals, and gives my body that extra boost I need. 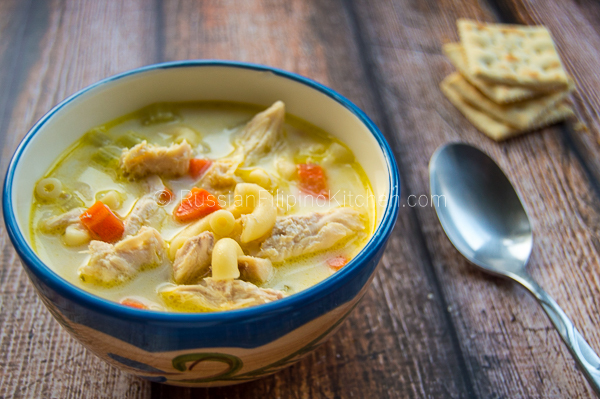 My favorite chicken soups include a light chicken soup with Vegeta seasoning, chicken sotanghon soup, tinolang manok, and this tasty Filipino-style chicken soup called “chicken sopas”. 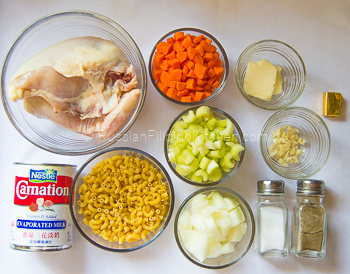 It’s creamy and delicious with shredded chicken meat, elbow macaroni pasta, carrots, celery, and evaporated milk. The secret to making a great broth is to use bone-in chicken parts. However, if you don’t have time to make it from scratch, substitute with canned chicken broth and omit the bouillon cube. 1. Fill a large cooking pot with 10 cups water. Add bone-in chicken and ½ teaspoon salt. Turn on stove and bring pot to a boil. 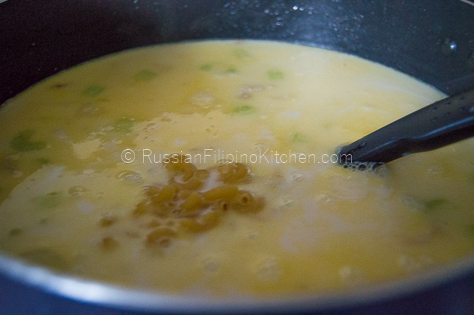 Once it starts boiling, lower heat to medium low and simmer for 45 minutes. Remove scum that floats to the top as the meat simmers. 2. Use a kitchen tong or fork to remove chicken from pot. Set aside. Separate meat from bones. Shred chicken and discard the bones. 3. Heat another cooking pot /Dutch oven over medium high and melt butter. 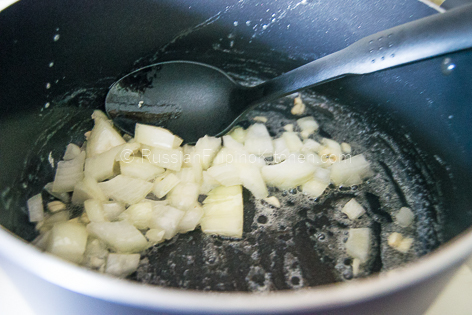 Saute onions and garlic till onions are soft and translucent and garlic has browned a little, about 2 minutes. 4. 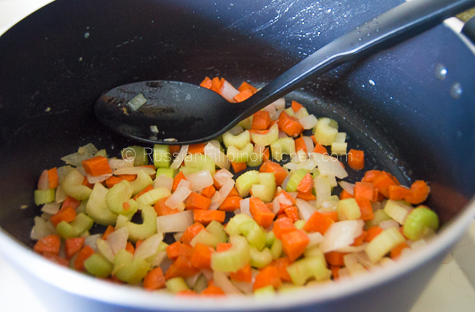 Throw in diced carrots and celery and sauté for another minute. 5. 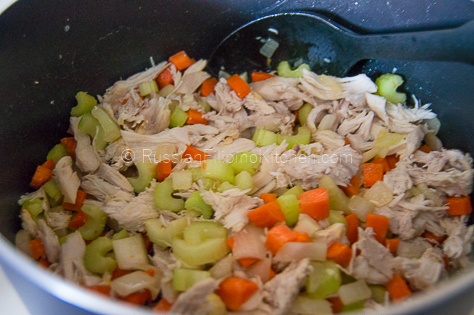 Add shredded chicken and sauté with the vegetables for 1-2 minutes. 6. 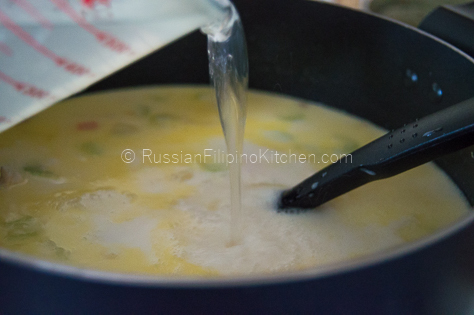 Pour in the evaporated milk. 7. Pour in chicken broth (about 8 cups). 8. Season with chicken bouillon and a pinch of ground black pepper. Stir. 9. Throw in elbow macaroni and stir. 10. Bring pot to a boil, lower heat and simmer for 20 minutes, until pasta and vegetables are thoroughly cooked. 11. Ladle into individual soup bowls and serve. Fill a large cooking pot with 10 cups water. Add bone-in chicken and ½ teaspoon salt. Turn on stove and bring pot to a boil. 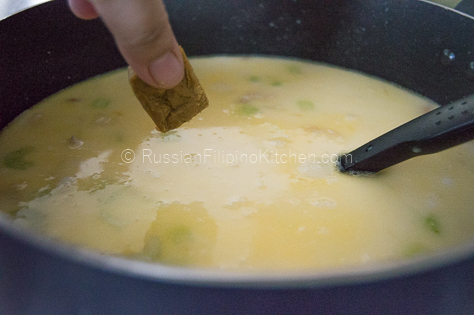 Once it starts boiling, lower heat to medium low and simmer for 45 minutes. Remove scum that floats to the top as the meat simmers. Use a kitchen tong or fork to remove chicken from pot. Set aside. Separate meat from bones. 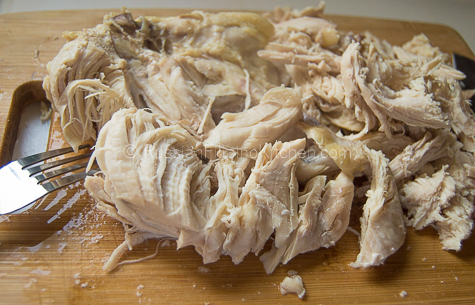 Shred chicken and discard the bones. Heat another cooking pot /Dutch oven over medium high and melt butter. Saute onions and garlic till onions are soft and translucent and garlic has browned a little, about 2 minutes. Throw in diced carrots and celery and sauté for another minute. 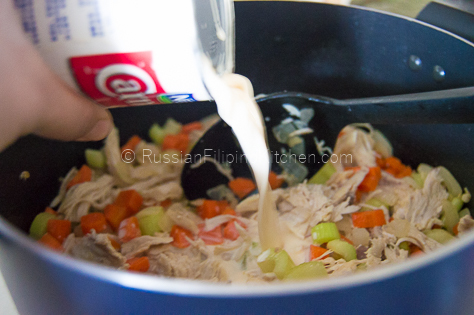 Add shredded chicken and sauté with the vegetables for 1-2 minutes. Pour in chicken broth (about 8 cups). Season with chicken bouillon and a pinch of ground black pepper. Stir. Throw in elbow macaroni and stir. Bring pot to a boil, lower heat and simmer for 20 minutes, until the pasta and vegetables are thoroughly cooked. Yes, it’s somewhat of a thick soup. Thanks for checking out my recipe! thanks for the recipe… very helpful..
You’re welcome and thanks for checking out my recipe! My sister made this for me and Wow, it’s awesome. 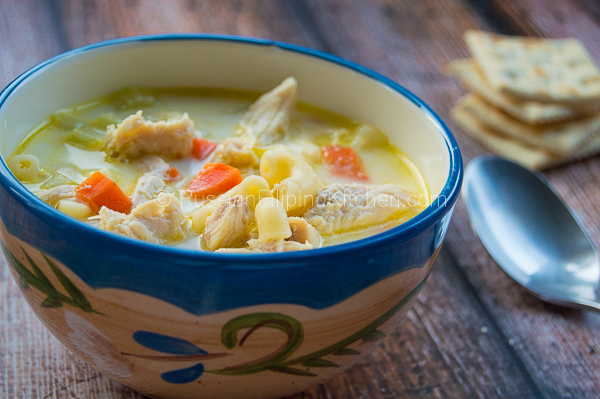 I haven’t had this soup in say 40+ years and this receipe brought so many childhood memories! Thank you ! I have cooked about 4 of your recipes and all of them came out PERFECT!!! Thank you!